Novice gardeners understand that pruning off suckers is a large part of annual apple tree pruning, but you must know what a sucker is and how do they identify it. Suckers are non-fruiting growth that sap energy from the fruit-bearing limbs of the apple tree. Once gardeners can identify suckers, they should remove them as part of their annual pruning routine. If a tree develops more suckers that typical, it could be a sign of declining tree health or over-pruning, according to Ron Smith, horticulturist. Never remove more than one-third of the tree's growth in a season. Check for suckers below the graft site of your apple tree, usually two to three inches above the soil line. The graft site is where your apple cultivar was grafted onto root stock and is identifiable as a thin horizontal scar. Any shoot growing in this location will be a sucker, or a fast-growing vegetative shoot. Clip off the suckers at their base using anvil pruners. Remove all suckers you encounter near the graft site. Study them so that you can identify them later. Apple tree suckers are tall and reedy and may have green leaves on the tips. All of the suckers on your tree will look similar to one another, so look for similar growth when checking your apple tree for suckers. Check for suckers along the rest of the apple tree trunk. Remove any suckers that you find. Examine any Y-intersections or crotches on your apple tree. These are intersections where two branches meet and they often resemble a Y. Suckers can spring from the center of these sites. Strip off any suckers you encounter. 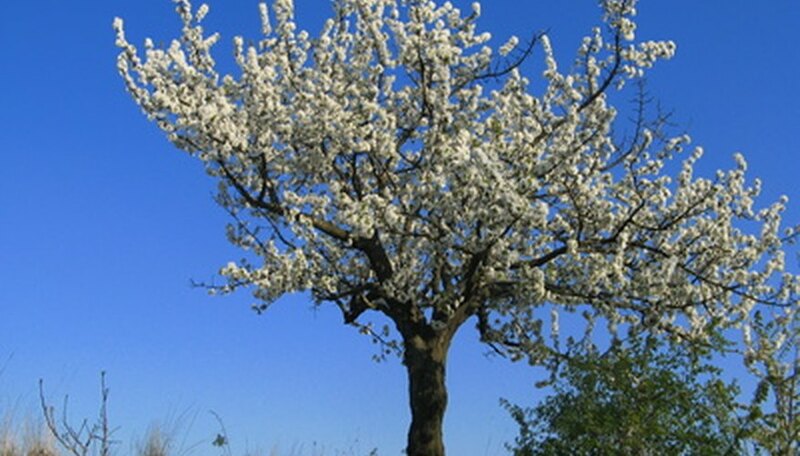 Check over your apple tree's branches, looking for places where you cut back branches the year before. Sometimes suckers grow out of old pruning cuts. Prune away any suckers you find growing out of old pruning cuts. Look for suckers in these locations any time you perform apple tree pruning. Always prune away suckers in the early spring or late winter, once frost danger has passed but before the apple tree comes out of dormancy and resumes growth.